Monday Morning Update: Suicide Squad took home the top spot amongst all upcoming films for the greatest like increase on Facebook over the past week. Weighing in just under 200,000 likes heavier, it managed to surpass the 2 million like mark even though it is still four months away from being released. Deadpool by comparison had less than 1.5 million likes the same distance before release so this a very strong sign for its potential. The Huntsman: Winter's War also continues to impress as it rose over 170,000 likes to almost 4.8 million likes overall. Yes it is true that it is reusing the Facebook page of the first film Snow White And The Huntsman so it had a big base to start from but since the start of 2016 it has managed 600,000 new likes which is nothing to scoff at. The first film had just under 1 million total likes on opening day. The Shallows continued to impress over the past week with a further 27,965 new likes, giving it the largest percentage jump in the top 10 on the week. The teaser really set it in the right direction and did a wonderful job of raising awareness. Curious to see how the first full trailer is received online but based on its early response, barring atrocious reviews its hard to see how this doesn't do very well coming opening day. Subscribe to Box Office for more social media insights/coverage. Please check the methodology page for information about our Twitter project. IMAX Signs Largest Deal In India; Five-Theatre Agreement With INOX Leisure Ltd.
NEW YORK, April 5, 2016 /PRNewswire/ -- IMAX Corporation (IMAX) (NYSE (NYX): IMAX) and INOX Leisure Limited (INOX), one of the largest exhibition chains in India, announced an agreement for five IMAX® theatres. The theatres will be added to existing INOX multiplexes in the cities of Mumbai, Bangalore, Delhi and Kolkata. The agreement represents the largest theatre deal for IMAX in India and brings the total number of IMAX theatres in the country to 20, with nine currently open and 11 contracted to open. Monday Update: With weekend actuals now in, Warner's Batman v Superman: Dawn of Justice took in $51.34 million this weekend. That represented a very sharp 69 percent decline from last weekend's debut and brings the film's ten-day total to $260.41 million. Disney's Zootopia was down a slim 20 percent from last weekend with $19.33 million and has grossed a massive $275.26 million in 31 days. Universal's My Big Fat Greek Wedding 2 followed in third place with $11.22 million. That was down 37 percent from last weekend and places the film's ten-day total at $36.58 million. Pure Flix's God's Not Dead 2 placed in fourth with an opening weekend take of $7.62 million, while fellow faith-based film Miracles from Heaven followed closely behind in fifth with $7.26 million. 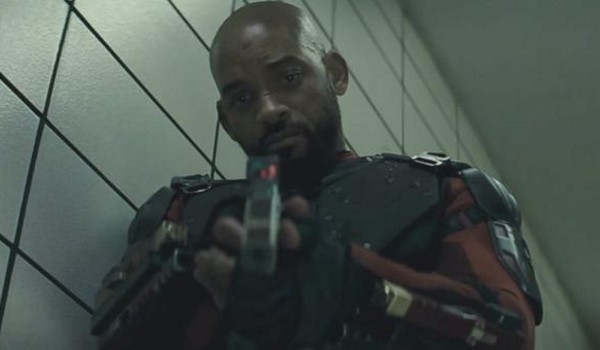 The Sony release was down just 25 percent and has grossed a healthy $46.53 million in 19 days. Sunday Update: Warner's Batman v Superman: Dawn of Justice easily remained in first place this weekend with an estimated $52.39 million. However, the blockbuster superhero film starring Ben Affleck and Henry Cavill was down an even sharper than expected 68 percent this weekend. Poor critical reviews, mixed word of mouth among moviegoers and built-in front-loading for the film to begin with have all had a clear effect on Batman v Superman. 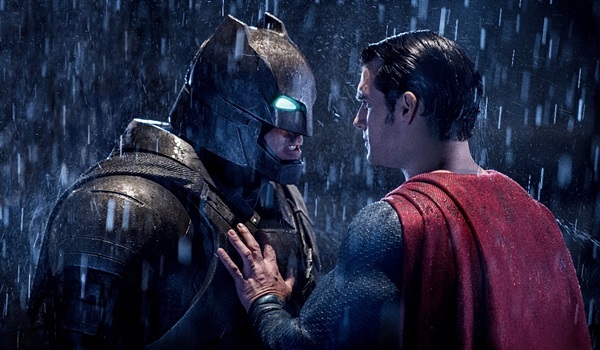 With that said, Batman v Superman has already passed the $250 million mark with a ten-day gross of $261.46 million. Without taking into account ticket price inflation, that represents the eleventh largest ten-day start of all-time. Batman v Superman is currently running 4 percent ahead of the $251.52 million ten-day take of last year's Furious 7 (which fell 59.5 percent in its second weekend to gross $59.59 million) and 17 percent behind the $313.40 million ten-day gross of last year's Avengers: Age of Ultron (which declined 59 percent in its second weekend to gross $77.75 million). After this weekend's decline, it will be especially important for Batman v Superman to attempt to stabilize next weekend. Batman v Superman: Dawn of Justice took in an estimated $4.2 million from IMAX locations this weekend. That represented 8 percent of the film's overall grosses this weekend. The film has grossed $25.3 million to date from IMAX locations. Zootopia held steady in second place with an estimated $20.0 million. The blockbuster 3D computer animated film from Walt Disney Animation Studios continued to hold up exceptionally well, as it was down a slim 17 percent from last weekend. Zootopia continues to be aided greatly by terrific word of mouth and animated films in general also tend to hold up very well the weekend after Easter weekend. Zootopia registered the seventh largest fifth weekend gross of all time. 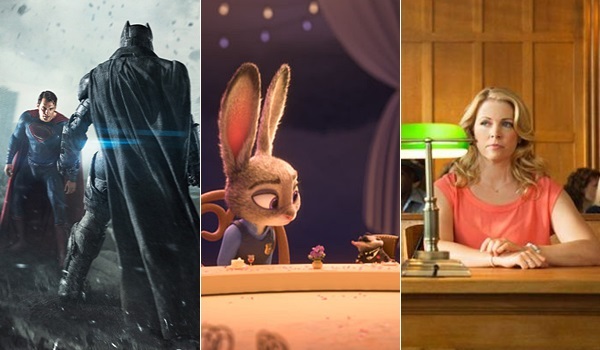 With a 31-day total of $275.94 million, Zootopia is running 23 percent ahead of the $224.88 million 31-day take of 2014's The LEGO Movie and 10 percent behind the $306.25 million 31-day gross of last year's Inside Out. Universal's My Big Fat Greek Wedding 2 took in an estimated $11.13 million to remain in third. The long-awaited comedy sequel starring and written by Nia Vardalos held up well, as it was down 38 percent from last weekend's debut. With fellow Universal comedy The Boss entering the marketplace this coming Friday, it was important for My Big fat Greek Wedding 2 to hold up well this weekend. My Big Fat Greek Wedding 2 continues to perform on the very high end of expectations with a ten-day take of $36.49 million. That places the film just behind the $36.59 million ten-day take of last year's The Intern (which fell 34 percent in its second weekend to gross $11.69 million). God's Not Dead 2 debuted in fourth place with an estimated $8.10 million. The faith-based sequel from Pure Flix performed below expectations and opened 12 percent below the $9.22 million debut of 2014's God's Not Dead. God's Not Dead 2 opening below its predecessor was especially underwhelming given that God's Not Dead 2 opened in 2,419 locations this weekend, while God's Not Dead opened in just 780 locations. At the same time, God's Not Dead 2 was still off to a respectable start with its low production cost in mind. God's Not Dead 2 also received a strong A rating on CinemaScore, which could point towards strong holding power for the film going forward. Fellow faith-based film Miracles from Heaven followed closely behind in fifth place with an estimated $7.55 million. The Sony release starring Jennifer Garner was down only 22 percent this weekend. That represented an especially strong hold given the new competition the film faced from God's Not Dead 2. Miracles from Heaven has grossed a healthy $46.82 million through 19 days of release. With continued strong word of mouth and the launch of God's Not Dead 2 behind it, Miracles from Heaven is likely to continue to hold up very well going forward. Freestyle's Meet the Blacks opened in eighth place with an estimated $4.09 million. The R-rated comedy starring Mike Epps was playing in a relatively modest 1,015 locations this weekend, which gave the film a solid per-location average of $4,026. Meet the Blacks opened towards the higher end of expectations. The film did open 31 percent below the recent $5.90 million start of fellow parody Fifty Shades of Black, but had been widely expected to open below that film. Meanwhile, Bleecker Street's Eye in the Sky had a successful expansion this weekend with an estimated ninth place take of $4.06 million. The critically acclaimed film starring Helen Mirren and the late Alan Rickman played in 1,029 locations, which gave the film a per-location average of $3,941 for the frame. Eye in the Sky has grossed $6.15 million in 24 days and will soon pass by the $7.86 million final gross of last year's Trumbo to become the highest grossing Bleecker Street release to date in the young history of the distributor. 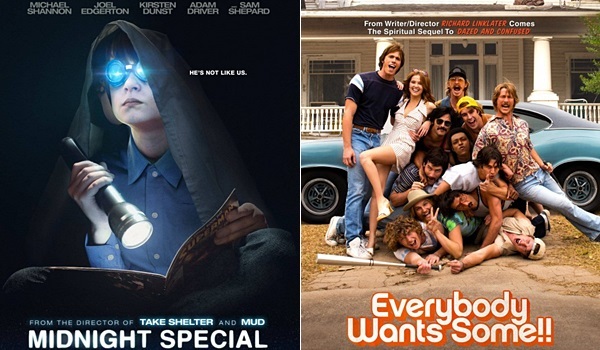 In its third weekend of platform release, Warner's Midnight Special took in an estimated $581,000 from 58 locations. That gave the Jeff Nichols directed sci-fi film starring Michael Shannon a per-location average of $10,017 for the frame. Midnight Special was up 481 percent over last weekend, when the film was playing in just 5 locations. Midnight Special has grossed $994,235 through 17 days of platform release. The film is running well ahead of the $272,521 17-day platform take of 2011's Take Shelter and will zoom past the $1.73 million final gross of Take Shelter before long. Paramount's Everybody Wants Some!! debuted with an estimated $323,000 from 19 locations, for a per-location average of $17,000. The Richard Linklater directed comedy has grossed $371,457 since its debut on Wednesday (the film played in 5 locations on Wednesday and Thursday). Everybody Wants Some!! didn't deliver the same type of platform launch that Linklater's Boyhood did back in 2014, when that film opened with $387,618 from 5 locations (for a per-location average of $77,524). This weekend's performance was much more in line with the $391,672 platform launch of 2006's A Scanner Darkly from 17 locations (for a per-location average of $23,039). Everybody Wants Some has received strong critical reviews, as the film currently boasts a 90 percent Tomatometer on Rotten Tomatoes. The film is scheduled to receive expansions on April 8 and on April 15. Sony Pictures Classics' Miles Ahead was off to a very encouraging platform start this weekend with an estimated $122,751 from four locations in New York and Los Angeles. That gave the Miles Davis biopic starring and directed by Don Cheadle a per-location average of $30,688, which was the strongest per-location average of any film this weekend. Critical reviews for Miles Ahead have been relatively mixed, as the film currently has a 71 percent Tomatometer on Rotten Tomatoes. Miles Ahead is scheduled to receive expansions on April 8, April 15 and April 22. Fellow Sony Pictures Classics release I Saw the Light was far less impressive upon expanding into moderate release with an estimated $745,435 from 741 locations. That gave the Hank Williams biopic starring Tom Hiddleston a per-location average of just $1,006 this weekend. I Saw the Light has grossed $806,672 in ten days, as poor critical reviews have clearly limited the film's potential. Chongqing Hot Pot started out with an estimated $197,000 from 20 locations. The Mandarin-language comedy thriller from China Lion Film generated a per-location average of $9,850 this weekend. Chongqing Hot Pot is scheduled to expand into an additional 20 locations on Friday. Meanwhile, Cinema Libre Studio's Vaxxed: From Cover-Up to Catastrophe made an impact this weekend with an estimated $22,000 launch at the Angelika Film Center in New York. The anti-vaccination documentary directed by Andrew Wakefield recently made headlines for being included in and then being removed from this year's Tribeca Film Festival schedule. In its second weekend of release, IFC's Born to Be Blue took in an estimated $85,200 from 20 locations, for a per-location average of $4,260. The Chet Baker biopic starring Ethan Hawke was up 84 percent over last weekend, when the film was playing in just 3 locations. The ten-day platform total for Born to Be Blue stands at $153,377. Batman v Superman: Dawn of Justice fell from grace in its 2nd overseas weekend though it still managed to win the weekend with $85.1 million (-67%) from 67 markets. The overseas total is now $421.4 million surpassing the lifetime cumes of Man of Steel and Deadpool. Worldwide, the Warner Bros. tentpole has earned $681.3 million. Top grossing territories this weekend were: China ($12.4M/$85M) where the film saw an incredible 80% drop, UK/Ireland ($6.4M/$39.7M), Brazil ($6.1M/$21.75M), Mexico ($5.2M/$29.7M), Germany ($3.4M/$14.4M), Australia ($3.4M/$17.2M), South Korea ($2.95M/$14.5M), Italy ($2.1M/$10.3M), Russia ($1.8M/$11.2M), Japan ($1.9M/$9.7M), Spain ($1.4M/$9.2M). Zootopia posted an estimated $30.0M in its eighth weekend of overseas release from 52 territories representing approximately 91% of the international marketplace. The Disney Animation original has now earned $511.7 million overseas and $787.6 million worldwide to become the 12th highest grossing animated release ever globally. China was down just 25% to $12.8 million, beating Batman v Superman on its fifth weekend of release. Zootopia has earned $215.3 million as the highest grossing animated film ever in the territory and recently received a two week release extension. Other top markets include: Russia ($30.3M), France ($28.2M), Germany ($26.8M), South Korea ($23.4M), UK ($18.0M), and Mexico ($16.8M). Japan will be the final international territory to open on April 23. My Big Fat Greek Wedding 2 grossed an estimated $5.6 million from 19 total overseas territories this weekend for an international total of $18.4 million. Combined with the US, the global total is now $54.9 million. Openings include Brazil ($819K), Colombia ($112K), and Peru ($111K). Among holdovers, Australia earned $2.2 million for an 11-day total of $7.4 million, and the UK/Ireland grossed $893k for a 10-day total of $3.5 million. Next weekend, the film opens in Greece, Cyprus, French-Switzerland, and Panama. The Divergent Series: Allegiant earned $4.3 million from 79 overseas markets, lifting the international total to a disappointing $80.3 million after one month of release. Miracles From Heaven opened in Mexico this weekend to $2.3 million, pushing its overseas total to $3.4 million and the global total to $50.2 million.